Lab 9 Data Link (clp_tls.laz). This is a large dataset, have patience!!! The “LAZ” file is a common point cloud file format storage type. You read a LAZ the same way you read a LAS – you process it using the same approach. 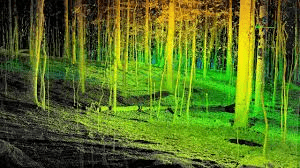 You will start with a point cloud from a ground-based LiDAR rig. This set up is also referred to as ”Terrestrial LiDAR”. You are starting with a point cloud that looks like this: . #####dtm1 = terrain model "bare ground model"
#####Export DTM, DSM, Crowns, and tree tops; view these in ArcMap. They do not have a defined coordinate system but the data are to scale; meters are the unit of measure. At this point, you have exported several raster TIFs and a point shapefile that you can view in ArcMap. You will get a Spatial Reference warning since these data do not have a defined coordinate system. This is one of the few instances where you can ignore this warning. TerrainModel.tif: This is the ground model (DTM). It was generated using the normalized point cloud, so its values should be near 0. CanopyHeightModel.tif: This is the surface model, the DSM. This layer was generated using the normalized point cloud, so its values reflect the pixel’s height above the (TerrainModel) surface. The units of measure are meters. The raster values are the sequential number assigned to each individual tree crown. This layer is exported as a float raster, so before you convert it to a polygon layer, you must run the INT(Spatial Analyst) tool in ArcMap to convert the real numbers to integers. Convert that output to a polygon layer with the RASTER TO POLYGON, and then join the CSV summaries on the gridcode and treeID fields. TreeTops.shp: This is a point shapefile marking each crown’s apex.